Before I purchased the DoxyTronics 8020CA antenna, I emailed the owner/manufacturer and asked if he felt this antenna would be a good choice with the radios that I own. He promptly and courteously answered my question and I purchased the antenna on September 30th. I received the antenna approximately 6-days after I ordered it. I have been evaluating the antenna for 5-6 weeks mostly on my Grundig Satellit 750 and my Grundig G3. I have used other portables but the two aforementioned Grundigs were the radios I used most. The antenna control box has a ¼-20 hole on the bottom so it can be mounted to a video camera tripod. The assembled antenna weighs 3 lbs. I tried using a light duty DSLR tripod that I own, however that was nowhere near sturdy enough. I had to use a heavier duty tripod (Ravelli AVT) that I use for astronomical purposes. This Ravelli has a weight capacity of 16 lbs and it easily supported the antenna. I’m confident a much smaller and lighter duty tripod than the Ravelli could be used, I simply don’t own anything in-between as my astronomical binoculars and binocular telescopes weigh 5 – 14 lbs. The 8020CA Antenna consists of a large tuning knob and control box. The control box has switch settings of 3-5 Mhz and 5-15 Mhz. In testing, I found that I could “tune” up to 17.840 MHz. No batteries are needed to operate. The antenna worked equally well with all of the “portable” radios that I tested (I am a SWL’er, not a ham). I can summarize the antenna’s performance as this: it is not a magic elixir that will allow you to capture signals too faint to recognize without the antenna attached, but it definitely enhances the signal and “stabilizes” it to the point where the level of the signal remains relatively constant (less peaks & troughs in signal strength). 02:00 – 02:30: This last 30-second segment is with the 8020CA attached, however I am panning the Ravelli tripod 360-degrees in the horizontal. You will hopefully notice that there is a “sweet spot” where the signal and reception is the best of the entire 2:30 recording. I had set-up the antenna and I completed a quick, test recording of Radio Romania. But conditions changed slightly and the best signal during the recoding was approximately 50-60-degrees away from where the best reception was earlier. This is a positive for the antenna: you can pan the tripod head where the antenna sits to null and/or find the best signal. 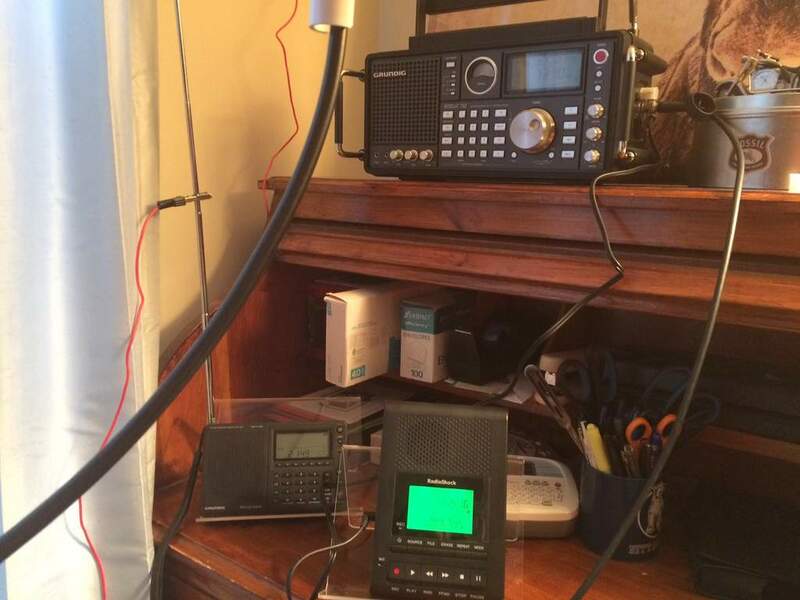 Note: this is my first shortwave and radio-related review I have ever done. I have done many astronomical reviews – where I have much more experience – so please be kind towards this first attempt. No worries, Troy! We’re kind and appreciative here–especially since guest posts are all about sharing our experiences and experimentation! I must say, the DoxyTronics loop is doing a fine job mitigating the local QRM/interference that is easily heard when only the telescopic whip is being used. I’m also impressed that a passive loop this modest in size has so much gain without amplification. Thanks, again, Troy for sharing your review! 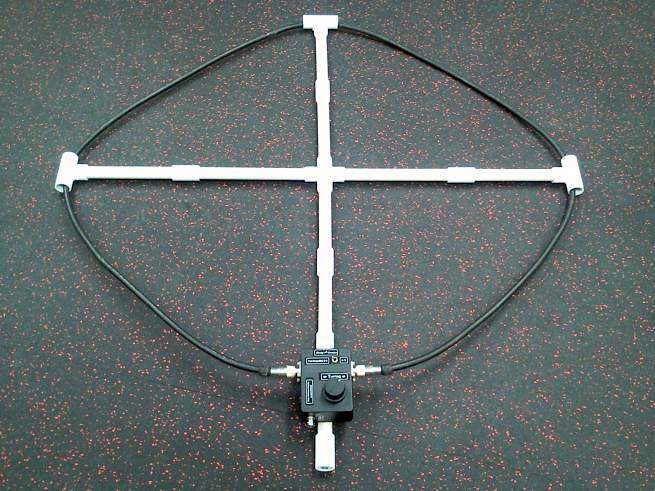 Click here to view and/or purchase the DoxyTronics 8020CA magnetic loop antenna. This entry was posted in Antennas, Articles, Guest Posts, Ham Radio, News, Reviews, Shortwave Radio and tagged Antennas, DoxyTronics 8020CA antenna, DoxyTronics 8020CA antenna review, DoxyTronics 8020CA magnetic loop antenna, Magnetic Loop Antennas, Troy Riedel on November 17, 2016 by Thomas. Thanks guys. We will have more of these available in about 2-3 weeks :). Hi everyone. My name is Darrell Hagan and I am the designer of this antenna. I am an avid SWL dating back to about 1974, and am a ham operator as well since 1978. My call is K7LZR. I am so happy that Troy and others are pleased with the 8020ca antenna, and I am happy to answer any questions if anybody needs. A major design goal of this antenna was portability, reasonable ruggedness, light weight, and that all tuning components are within the tuning box so that there would be good repeatability with tuning and also fewer components to keep track of. Many have asked about a higher frequency version. I am working on such a thing but haven’t had much time lately to spend in the RF lab here because I also work almost full-time as an aerobics instructor for the YMCA, and it has been taking much time lately. I am thinking in terms of a new tuning box only which covers about 15-30mhz, for use with the existing loop. We would then offer said tuning box at a good price with an additional discount to existing 8020ca owners. You would then simply use whichever tuning box covers the range(s) of interest. The reason that the 8020ca antenna covers only to 15mhz was not a business decision, but it was by design because of the want to cover down to about 3mhz with reasonable RX effeciency, and also because of the variable capacitor which we use in these antennas. During design, I did think about using the Poly Film capacitors from Asia but most of them didn’t show the quality which we wanted for this and I also didn’t want a plastic capacitor to be rendered useless should an operator accidentally arc same during transmit. So I chose some very good quality all-metal air variable capacitors and they have proven to be great but the capacitance range will not allow higher frequency operation with this design. I’m really glad to see this antenna reviewed here because it is actually intended more for receiving but will also handle some transmit power :). Thanks again guys, please let me know any questions. You can always use then contact page on the Doxytronics website, and I will check here also. The antenna looks good and I totally get what you are saying regarding 3-15Mhz coverage. I have been here as well regarding coverage for my homebrew loop, albeit in a more hobbyist tinkering capacity with your antenna employing different methods with different challenges. I built my mag loop pretty much for portability and reasonable performance across the frequency range (3-30Mhz) as I did a lot of travelling (by car) at the time. I tried the Poly Film capacitors and the efficiency was drastically reduced and only good quality metal variable capacitors (I used reduction drive) gave decent results along with a good skin effect coverage on the main antenna portion (wire is not good, microbore pipe or good quality coax is good), however good quality capacitors end up costing more than anything else in the antenna system. The 15Mhz+ coverage is not a major issue, just a nice to have, from a SWL standpoint, I rarely tune above 17MHz only going to 21MHz in the summer on peak sunspot season as that band is a joy to use then. Your plug in box is a good idea as not everyone will want the full coverage and those who do will buy it. I will purchase the antenna as I have a lot of faith in Mag Loops and the Doxytronics is very reasonably priced. Thanks for including that YouTube link … I watched that as part of my initial consideration to buy it. Initially I was disappointed it only covered 3-15 Mhz, however I was able to tune up to 17.840 Mhz … and as a shortwave listener, the antenna covers nearly all of the international broadcasters who are still on the air. Very interesting mag loop antenna, I use a homebrew mag loop that covers 3-30Mhz which employs the traditional pickup loop method (not tried a shielded loop yet, but hoping to soon). I don’t think the Doxytronics employs a shielded loop method though? coupling components to be housed within a single enclosure”. more. High signal transfer efficiency is maintained throughout the usable bandwidth”. Would be nice to get the full HF range rather than 3-15Mhz but I suspect this is a business decision to introduce one later…a good move in my book, nothing wrong with that at all. I wish them all the success with this. Maybe one could think of splitting adjacent stations similar to splitting binary stars, needs power and resolution to do so effectively. I only included that one recording b/c I was unsure of how many people would actually be interested in it 🙂 The Radio Romania recording was very representative of what the antenna can do. There have also been many instances where I could barely hear a signal – the BBC to Africa on, I think – 9410 – and this Loop Antenna brought the signal up to a point where it was much more easily audible. I may make some more recordings & send them to Thomas. I have loads of free time right now. Thanks, Troy, for the nice review. I like that it is passive but that forces the tuner and antenna to be near the operator. I will be experimenting with my amplified small 14″ loop soon using my car as a “portable shack”. Would be interesting to hear from you with more tests like weak signal capture as well as nulling out a strong station next to a weak one. A favorite station of mine is the 1kW on 6185 from Mexico City and it routinely gets swamped by the strong Brazilian on 6180. That should be a good, easy test of a loop if you live near the middle of North America. Always wanted a loop antenna but the prices were always a bit high, this one seems reasonable, thank you for the review Troy. My pleasure. This antenna was initially priced at $139.99, but recently it has been listed under $100. This outperforms my expensive AOR 380LA. It would be very interesting perform a similar review on TX. Check the manufacturer’s web site. This antenna is made to be “pack friendly” for a Dx’pedition because all pieces of PVC break down. The manufacturer states “Handles 25w PEP SSB, 15w Digital modes”. It looks a lot like MFJ’s 9232 loop tuner. I think technically this is a loop tuner and not exactly a magnetic loop tuner but either way, being portable and all, great job reviewing an interesting gadget. 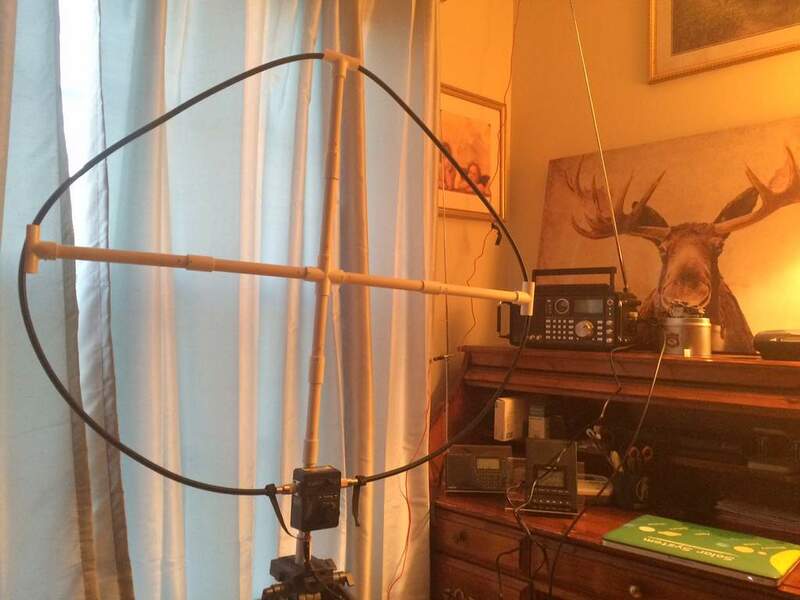 Yes, indeed it does look like the MFJ with a PVC Cross Loop Antenna. The DoxyTronics is truly portable. I have room for the antenna, several cables, and 1-2 portable receivers that fit into a Plano Four Pistol Case. I discovered those cases a few years ago for my telescope eyepieces – then I bought more for other astronomical gear – and now I have several to store &/or transport shortwave gear. In fact, I may carry it to Mississippi while visiting the in-laws over the Holidays. The biggest piece is the user supplied video tripod. Excellent look and listen for the 8020CA! If I may ask, what is your general receiving location? I contributed a guest post a couple of weeks ago describing my listening post. It’s a “sitting room” on the back of the house, north side, wide-open to the master bedroom on the 2nd floor of my two story house. I tried various locations and that is the best. I can hardly get any reception on the 1st floor.